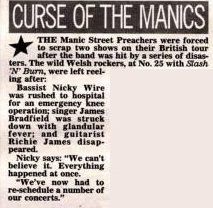 Bassist Nicky Wire was rushed to hospital for an emergency knee operation; singer James Bradfield was struck down with glandular fever; and guitarist Richie James disappeared. Nicky says: "We can't believe it. Everything happened at once." "We've now had to re-schedule a number of our concerts." This page was last modified on 26 March 2018, at 14:33.